Nairobi (Agenzia Fides) - "It is coming at the right time, soon we will have the radio, so the agents will contribute to the radio programs because people need to know what happens at the grass root levels" said His Exc. Mgr. Paul Kariuki Njiru, Bishop of Embu, addressing the thirty Parish Communication Agents who have just finished their formation course organized by the Episcopal Commission for Social Communications. Mgr. Kariuki urged the newly elected operators to narrate the situation of the needy and to report the many good works that the Church does in her mission of evangelization. "Transform life of others by highlighting the plight of the poor in the community so that people can volunteer to support. Be Agents who can help in gathering information that is very much different from the secular media". The National Executive Secretary of the Episcopal Commission for Social Communications, Fr. 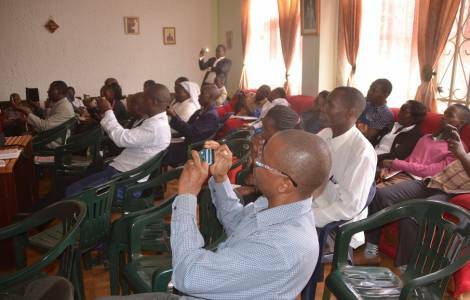 Elias Mokua, said that the purpose of the training is to support KCCB to communicate to the people of Kenya both Catholics and non-Catholics and to develop a national communication network that promotes Catholic identity, values, peace and justice. "There is a greater need for us to use our national strength as Catholic Church to evangelize, teach the gospel values, promote social justice, reach out to dioceses that do not have radio or print, in order to create an ‘Online Catholic Church’ – a church that uses modern media technology to evangelize", he stressed.